Merry Christmas, Happy Hanukkah, Blessed Winter Solstice! I hope your holidays have been as enjoyable as mine have been. This December I’ve used my vacation to spend time with family and savor our Christmas traditions more than I have in many years. The presents were less plentiful this year, but I can’t say I missed them. Good friends and family, happy dogs, and delicious food were all the gifts I needed (or wanted!). I’m a quiet, introspective person so spending the holidays with my very small immediate family while we cook traditional Peruvian and Romanian dishes and watch Christmas classics on television is my idea of a perfect Christmas. I have friends who are far from loved ones this winter and I feel for everyone who can’t spent this holiday in the comfort of home. There’s a classic Spanish Christmas song that always brings a tear to my eye when I hear it. If you’re far from the ones you hold dear, then this song is for you. para ti tengo un lugar For you I have a place. Ven a mi casa esta Navidad Come to my house this Christmas. él te acompañará He will accompany you. queriéndote aturdir Wanting to be in a daze. intenta sonreír Try to smile. Luis Alguile sings a beautiful version of this Spanish classic. Even if you don’t understand Spanish, the catchy melody and the emotion in his voice cross language barriers.Click here to listen to this song on YouTube. Here are some recent photos of my dogs to keep you company if you are missing your own pets or are living in a place that doesn’t allow animals. Happy holidays to everyone out in Internet-land! For those of us fortunate enough to have grown up during a time when game developers were just beginning to explore the potential of 8-bit graphics, the sight of an NES zapper calls to mind nostalgia. 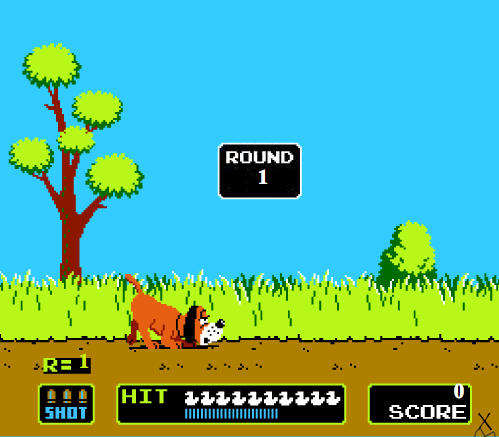 Duck Hunt was the very first first-person shooter I ever played, and it is still the most memorable. While pointing the light gun at anything was fun in the beginning, when I was done fooling around and wanted to actually be successful at the game I had to learn how to aim properly to hit the targets. In writing, paragraphs have to be aimed towards targets as well. Topic sentences accomplish this task for you by pointing your paragraphs in the direction of the main point you're trying to cover. They also let your reader know where you're heading, clarify your ideas, and organize your points. It's can be fun and productive to just mess around writing anything that comes to mind, but if you want your paper to have any chance of being successful, you need to add topic sentences. A topic sentence is a sentence that states the main idea of a paragraph. It is usually, but not always, located at the beginning of the paragraph. Additionally, a good topic sentence is concise, taking no more words than are absolutely necessary to state the main idea. Hopefully this definition sounds familiar to you. If not, take a peek at my post about thesis statements. Getting a feeling of deja vu yet? Topic sentences and thesis statements are so similar to one another because they both serve to focus writing. Whereas a thesis statement states the direction of an entire essay and is located at the end of the introductory paragraph, a topic sentence only states the focus of a single paragraph and is placed at its beginning. Interestingly, when you break a paragraph down to its basic components, it's essentially a miniature essay. However, that's a topic to tackle in another post. It’s time to see what topic sentences look like in action. In the following examples, I will write the topic sentences in bold for easier identification. Notice how the topic sentence contains the main idea of the paragraph and the remaining sentences are 1) relevant and 2) support and/or expand on the topic sentence. ~Solovic, Susan W. The Girls' Guide to Power and Success. New York: MJF Books, 2001. 79. Print. "Unlike a disease, which has a specific pathological origin, a syndrome is a condition that exists only as a collection of symptoms. Consider cystic fibrosis, a disease that causes the body to produce an unnaturally large amount of sticky mucous, resulting in long-term deterioration of the lungs, as well as other conditions related to mucous production. The disease is present when a person receives a specific gene from both parents. The genes are the cause, the excess mucous production is the effect, and the lung deterioration and a few other conditions are the symptoms. The symptoms are specific to the disease and lead to the specific diagnosis." ~Hammerly, Milton, and Cheryl Kimball. What to Do When the Doctor Says It's PCOS. Massachusetts: Fair Winds Press, 2003. 91. Print. ~Beneke, Jeff. The Fence Bible. Massachusetts: Storey Publishing, 2005. 13. Print. Don't pick up your favorite novel to find examples of topic sentences. In fact, most professional writers whose work is found in bookstores do not use explicit topic sentences in their writing. You definitely won't find many topic sentences in journalism or online; people perusing Internet posts and newspaper articles have short attention spans and will not read large chunks of text, so paragraphs are often no longer than two sentences (if even that long). However, topic sentences are expected and often required in academic writing, including writing produced in professions that require reports (e.g., medical professionals writing research, lawyers and paralegals working on briefs, and even managers writing productivity reports). If you have any aspirations of making it through your high-school, college, and professional writing responsibilities unscathed, you're going to need to learn start writing topic sentences. But don’t think of topic sentences as a chore; the fact is, writing them will end up saving you time and effort. Getting in the habit of writing topic sentences for each paragraph as you work on an essay will actually make writing your essay faster and easier. You have to know what you're trying to say with each paragraph before you can write the topic sentence, so you're essentially being forced to organize your thoughts as you commit them to paper. As someone who's written more essays than she can count during the span of her still-ongoing academic life, trust me when I say making an outline of your main points before you start writing will make writing topic sentences a piece of cake. Once you know what main point or sub-point you're presenting in a paragraph, all that's left to do is supply the evidence to support the paragraph’s main point. Why wouldn't you want to make essay writing easier for yourself? A topic sentence is a sentence that writes itself because if you know your main point, you know your topic sentence. It's essentially one less sentence you have struggle over in your essay, letting you focus your energy where you need it most: supporting your arguments. Not only do topic sentences help you write papers, being able to identify other writers’ topic sentences has benefits of its own. Since a topic sentence contains the main idea of a paragraph, it can be used to summarize writing sections easily and efficiently. Professional tutoring services for the SAT and LSAT frequently teach students to look for topic sentences in paragraphs as a simple, fast “trick” to locate information to answer questions. Apply this technique to textbooks to isolate important points quickly and create an outline of each chapter’s main ideas. Topic sentences are considered one of the basics of good writing and mastering them is not something most people can accomplish without practice. There is much more to learning how to execute them successfully than what I can contain in a single blog post, so stay tuned for future posts that transform main points in an outline into topic sentences, break down the elements of essay paragraphs, and include examples of paragraphs missing topic sentences. I will be writing many more blog posts on this topic because I know just how essential a skill writing topic sentences is for you to be successful in your writing endeavors. A dog in the game Duck Hunt held up the birds you shot when you aimed well. Readers won't do that to let you know your paragraphs hit the mark so remember to get feedback on your writing before you submit it to a professor or supervisor.